Get to Know Stacey Tookey with Our Mini Interview. Today we have the pleasure to present you a mini interview we did with our World Dance Movement faulty member, Stacey Tookey who will teach Contemporary Dance at WDM ITALY, week 3: July 26-31, 2016. For her full bio, click here. WDM: What are the songs you are listening to the most at the moment? Stacey: I love a lot of different kinds of music, but recently I have been listening to Max Richter, Sóley and of course Adele‘s new album!!! It’s incredible. WDM: What’s your favorite snack before and after class? When I have access to a blender a green smoothie for sure – kale, spinach, almonds, coconut water and some fruit. On the go: RX Bars!!! They are gluten, dairy and refined sugar free and come in incredible flavors. Stacey with her brother Kevin (who also is a professional dancer). WDM: What advice can you give to young dancers? Always be hungry to learn more!!! Different styles of choreography, different teachers in different settings. Information is key and a dancer who is always eager to grow and learn is one I always want to work with. If something doesn’t go right…try, try again!!! WDM: How and why did you become a dancer? My mom Shelley Tookey has a dance studio she has owned for over 45 years (Shelley’s Dance Company). Her first studio was in our basement…..I danced since I can remember being able to walk :). When I was 8 I turned to my mom and said: “Mom, I’m going to do this for my job, I love it so much”. To this day she always reminds me of that story. What’s the advice you would give to a dancer for an audition? Be BRAVE. Be BOLD. Be YOURSELF……… Confidence and openness goes much further than the act of trying to be perfect. Often when you let go and treat the audition like a class is when you have the best outcome. Oggi abbiamo il piacere di presentarvi una mini intervista che abbiamo fatto con l’insegnante del WDM, Stacey Tookey che insegnerà Danza Contemporanea al WDM ITALIA, settimana 3: 26-31 Luglio, 2016. WDM: Quali canzoni stai ascoltando di più al momento? Stacey: Amo molti generi di musica differenti, ma recentemente sto ascoltando Max Richter, Sóley e ovviamente il nuovo album di Adele!!! È fantastico. WDM: Qual è il tuo snack preferito prima e dopo lezione? Quando sono a casa, sicuramente un frullato di verdure e frutta – cavolo riccio, spinaci, mandorle, acqua di coccoe frutta. Quando non sono a casa: le barrette RX!!! Sono senza glutine, latte o zucchero e hanno tanti gusti diversi buonissimi. WDM: Quale consiglio daresti a dei giovani danzatori? Abbiate sempre la voglia di imparare di più!!! Stili di coreografia differenti, insegnanti differenti, in ambienti differenti. La conoscenza è un elemento chiave e un danzatore che ha sempre il desiderio di crescere ed imparare è il tipo di persona con la quale voglio lavorare. Se qualcosa non va per il verso giusto…prova e prova ancora!!! Uno dei primi concorsi vinti da Stacey. WDM: Come e perché hai iniziato a danzare? Mia madre Shelley Tookey ha una scuola di danza che possiede da oltre 45 anni (Shelley’s Dance Company). La sua prima scuola era del seminterrato della nostra casa…. danzo da quando ho iniziato a camminare :). Quando avevo 8 anni ho detto a mia madre: “Mamma, questo sarà il mio lavoro, lo amo troppo”. Ancora oggi, ogni tanto, mi racconta di quel giorno. Quale consiglio daresti ad un danzatore per un’audizione? Sii CORAGGIOSO. Sii TE STESSO… La sicurezza e apertura sono molto più importanti del provare ad essere perfetti. Spesso quando vai ad un’audizione come se fosse una lezione ottieni i risultati migliori. A Magical Night at World Dance Movement Italy 2015. Scorri verso il basso per leggere in Italiano. At World Dance Movement Italy 2015 we had the chance to partake in a unique experience that moved us and made us understand even more the real meaning of dance and life. Martina Marcon is one of our most loving students who never misses a WDM class and observes all the teachers and dancers with undivided attention and passion. Martina wrote us an inspiring letter (you will find an extract below). In the letter she expressed the desire to make dance her career by teaching and choreographing and so we decided to make her dream come true by giving her the opportunity to be on the stage and choreograph a pas de deux for two of our WDM dancers. Below you can read an extract from Martina’s letter. She explains what Dance means to her, but we think that her words are much more. They can be consider a true Dance Manifesto. When I see someone dancing, I feel like I’m standing. Dance is my life, because it is the only thing that makes me feel “normal”, like everybody else. My passion for dance was born in 2002 while watching an Italian TV show called “Amici di Maria De Filippi”. I could teach dance to dancers 13+. I cant teach younger dancers because I can’t demonstrate the steps, but I can talk to older dancers who are more familiar with the names of the steps and technique. I love all dance styles, but ballet is my favorite. This dance style “makes my body free” and expresses everything I feel. I’ve been attending classes at a dance studio in Bolzano since 2009, my teachers Elisa and Anita are an example to me. Before I had to travel out of town to participate in a class and I couldn’t go very often, but now I get the chance to go three times per week. They don’t realize how much this means to me. I didn’t think I could be accepted so well in a dance studio because it is rare that a disabled person loves dance. Dance is like air to me, like a drug, I can’t be without it. It’s the only thing that gives meaning to my life. If God told me: “You will be able to walk, but you can’t dance” I will answer: “No thanks, then I don’t need it.” I would only want to walk to dance, otherwise it’s ok to be like I am now. I get so annoyed when I see dancers who don’t put effort in what they do because I would give everything to use what God gave me if I was them. I would like them to realize that there are people like me who would like to dance but they can’t! For those who were not there we are excited to show you a video of that special evening. You can also find our interview with Martina below. Enjoy! WDM: This year you had the opportunity to choreograph a piece for one of the WDM Italy Gala Performances. Tell us about this experience. Martina: The experience as a choreographer was beautiful. It was my first time, but I was not afraid. I felt like I always did that. I can not describe the emotion I felt when I was asked to do create a piece for the show. I accepted without even thinking about it for one second. The only difficulties that I encountered were: playing the music and communicating clearly with the dancers due to the fact that my speaking is not fluid, but Patrizia Cribiori (WDM Dance Shop’s owner) assisted me with those issues. I also had some problems with one of the lifts that the dancers had to perform because I did not know how to explain to them how to perform it in a simple way, but with the help of Michèle Assaf I did. However, I did not want Michèle to see the piece before the show because I wanted it to be a surprise. At the end of the performance all the teachers complimented me. The fact that people with 30 years of career in the dance field recognized my work was extremely important for me. WDM: You also had the chance to be one of the protagonists on the stage during one of the WDM Italy Gala Performances. How did it feel being on the stage? Martina: Dancing on the stage was amazing, even if it wasn’t my first time. It was a big emotion and I was honored. I was a little shaky because I didn’t want to disappoint anyone but at the end I was happy to see that they all appreciated what I did. I am very critical of myself when dancing even if I have physical limitations. I wish the audience could see me simply as a dancer, but I know it is difficult to see beyond my disability. Fortunately some people are able to see what I can do without worrying about my difficulties. WDM: How would you describe WDM Italy to a dancer who has never participated in one of our events? Martina: I have been in love with dance for 13 years. I participated in many workshops, but given the high level of the teachers and dancers, World Dance Movement is one of the few that I really think can help shape professional dancers. The workshop lasts three weeks, the faculty members expect much from the dancers because at the end of each week there is a performance. Dancers have to remember many pieces and it is an experience that demands hard work. I have never seen a workshop that awards so many dance scholarships. WDM helps you transition to the professional dance world. One of the things that makes WDM special, is the fact that the majority of dancers and faculty members stay at the same hotel. This allows the students to interact with the teachers, connect and network. WDM: What piece of advice would you give to a student who would like to become a professional in the dance world? Martina: If you are trying to become a professional dancers, besides having the physical qualities that are generally required, you need to use your brain. Dancers that don’t use their head won’t be able to survive in the professional world. In Italy there are not many dance jobs and the majority are in Rome and Milan, so if you want to grow in this industry you need to be willing to travel. You might not have all the physical qualities; but you need to be able to compensate with your talent and hard work. WDM: Tell us your dreams for the future. Martina: I have been studying dance in a studio in Bolzano for 6 years and I hope that I will able to work in the dance industry one day. I understand that my disability might make people doubt about my capabilities, but I think that everyone deserves to have the possibility to show what they can do. You can’t judge a person before putting them to the test. We hope you are inspired by Martina as much as we are. We can’t wait to dance with you at WDM Italia 2016! Castellana Grotte (Bari), July 10-31, 2016. You can choose one, two or three weeks. For more info please visit WDMItaly.com. Al World Dance Movement Italia 2015 abbiamo avuto la possibilità di vivere un’esperienza unica che ci ha emozionato e fatto comprendere ancora di più il vero significato della danza e della vita. Martina Marcon è una delle nostre studentesse più affezionate. Non perde mai una lezione del WDM osservando con attenzione e passione ogni insegnante e danzatore. Durante la scorsa edizione del World Dance Movement Italia Martina ci scrisse una bellissima lettera (potrete leggere un breve estratto di seguito) in cui, tra le molte cose, ci espresse il desiderio di fare della danza la sua carriera insegnando e coreografando. Per questo motivo abbiamo voluto esaudire il suo desiderio dandole la possibilità di essere sul palco ma anche di coreografare un passo a due per dei danzatori del WDM. Questo è un piccolo estratto dalla lettera. Martina spiega cosa la Danza rappresenta per lei, ma noi pensiamo che le sue parole abbiano un significato molto più profondo e che possano essere considerate un vero e proprio Manifesto della Danza. La danza è la mia vita, perché è l’unica cosa che riesce a farmi sentire “normale”, come tutti i miei coetanei. Questa passione per la danza è nata nel 2002 guardando la trasmissione “Amici di Maria De Filippi”. Vedendo Rossella Brescia sono rimasta impressionata dalla sua bravura. Nel 2004 ho avuto la fortuna di incontrarla. Potrei insegnare danza agli allievi dai 13 anni in su. A quelli più piccoli, non posso farlo, perché purtroppo sono impossibilitata a dimostrare le coreografie, ma a quelli più grandi basta solo che tu dica loro i nomi dei passi da eseguire e che gli vengano fatte eventuali correzioni. Amo tutta la danza, ma lo stile che mi emoziona di più è la danza classica. Questo stile “libera“ il mio corpo ed esprime tutto ciò che provo. Dal 2009 frequento una scuola a Bolzano, le mie insegnanti Elisa ed Anita sono diventate un grandissimo punto di riferimento. Elisa insegna danza contemporanea ed è anche la direttrice della scuola ed Anita, insegna danza classica. Mi hanno dato la vita per la seconda volta, perché, prima per assistere alle lezioni di danza dovevo andare fuori città, quindi, andavo poco, mentre adesso vado 3 volte alla settimana. Non si rendono conto di quanto sia fondamentale. Non pensavo di essere accettata così bene in una scuola di ballo, perché, è raro che una persona disabile dalla nascita, ami la danza. La danza è come l’aria, come una droga, quando non ce l’ho sto male. È l’unica cosa che dà un senso alla mia vita. Se Dio mi dicesse: “Ti faccio camminare, ma non potrai ballare”, gli risponderei: “No grazie, allora non mi serve.” Camminare mi servirebbe soltanto per poi poter ballare, altrimenti tanto vale rimanere così come sono. Mi dà molto fastidio quando vedo allievi che non si impegnano perché io farei di tutto per sfruttare le possibilità che Dio mi ha dato. Vorrei far capire a tutti questi ragazzi che c’è gente che come me vorrebbe farlo, ma non può! Per coloro che non erano presenti abbiamo il piacere di presentarvi il video della serata e subito dopo la nostra intervista con Martina. Clicca sull’immagine per visualizzare il video. WDM: Quest’anno ti è stata data la possibilità di coreografare un pezzo per uno degli spettacoli di gala del WDM Italia. Com’è stata questa esperienza? Martina: L’esperienza come coreografa è stata bellissima. Era la mia prima volta, ma non ho avuto paura. Mi sembrava di averlo sempre fatto. Non so descrivere l’emozione che ho provato quando Michele me l’ha proposto. Ho accettato senza pensarci neanche un secondo. Le uniche difficoltà che ho trovato nel coreografare sono state: far partire la musica autonomamente ed il farmi capire dato che non ho un linguaggio fluido, ma per questo mi sono fatta aiutare da Patrizia Cribiori. Ho anche avuto difficoltà con una presa, perché non sapevo come spiegare ai ballerini quali erano i vari passaggi per farla al meglio, ma con l’aiuto di Michèle Assaf ce l’ho fatta. Non ho voluto che Michèle vedesse le prove prima dello spettacolo perché doveva essere una sopresa. Alla fine della performance gli insegnanti mi hanno riempita di complimenti. Per me è un grande orgoglio che delle persone con 30 anni di carriera in questo campo, mi abbiano fatto così tanti elogi alla mia prima esperienza. Il pensiero delle persone incompetenti per me conta poco, anche se mi fa piacere ascoltare la loro opinione. Per accrescere le mie competenze nella danza, ho bisogno del giudizio delle persone che lavorano in questo ambito. WDM: Nello stesso spettacolo sei stata anche la protagonista in una delle coreografie presentate durante uno degli spettacoli di Gala. Cosa hai provato ad essere sul palco? Martina: Ballare sul palco è stata un’emozione forte, anche se non era la mia prima volta. Per fortuna ho avuto altre possibilità di potermi esibire sul palcoscenico, ma è stata comunque una stupenda emozione, perché stimo molto Michèle ed avere ballato una coreografia sua è stato un grande onore. Ero agitata per la mia performance, invece, per la coreografia montata da me ero sicura del lavoro che avevo fatto. Mi sentivo in dovere di ballarla al meglio e non mi sarei mai perdonata se le avessi fatto fare una brutta figura. Per fortuna alla fine dello spettacolo, ho potuto constatare di averla resa felice anche ballando. Sono molto autocritica quando danzo, nonostante le mie capacità motorie siano limitate. Vorrei che il pubblico mi vedesse come una ballerina normodotata, anche se purtroppo per gli spettatatori è difficile andare oltre l’apparenza. WDM: Se dovessi descrivere il WDM Italia ad un danzatore che non ha mai partecipato allo stage, cosa gli diresti? Martina: Sono 13 anni che amo la danza e ho frequentato molti stage, ma il World Dance Movement dato l’alto livello degli insegnanti e degli allievi, è uno dei pochi che ritengo in grado di formare in maniera ottimale i ballerini. Il Workshop dura tre settimane, i coreografi si aspettano molto dagli allievi perchè ogni fine settimana c’è uno spettacolo. Devi avere memoria ed impegnarti molto se vuoi fare questa esperienza. Non ho mai visto uno stage che offre così tante borse di studio prestigiose. Se sei veramente meritevole, ti aiuta a far si che la danza diventi un lavoro. La cosa più bella per quanto mi riguarda è che la maggior parte degli allievi alloggia nello stesso albergo degli insegnati, quindi la sera ci si può fermare a parlare con loro. WDM: Se dovessi dare un consiglio ad un/una ragazzo/a che sta cercando di diventare un professionista nell’ambito della danza, cosa gli/le diresti? Martina: Se stai cercando di far diventare la tua passione per la danza il tuo lavoro, oltre ad essere dotata fisicamente, devi anche saper usare il cervello. Una ballerina che non usa la testa, non potrà mai diventare una professionista. In Italia lavoro ce n’è poco ed è nella maggior parte dei casi a Roma o a Milano. Per crescere veramente bene in quest’ambito, devi essere disposta a viaggiare. Puoi anche non essere molto dotata fisicamente, ma devi compensare con il tuo talento ed impegno. WDM: Quali sono i tuoi sogni per il futuro? Martina: Da 6 anni frequento una scuola di danza qui a Bolzano e mi auguro anche che un domani la danza posso diventare il mio lavoro. Capisco che essendo disabile, si possa essere scettici sulle mie abilità, ma credo che tutti meritino di poter dimostarare le proprie capacità. Non si può giudicare una persona, senza prima averla messa alla prova. Speriamo che la storia di Martina vi abbia inspirato. Vi aspettiamo al WDM Italia 2016! Castellana Grotte (Bari), 10-31 Luglio, 2016. Potete partecipare ad una, due o tre settimane dello stage. Per maggiori informazioni visitate WDMItaly.com. We are extremely excited to announce our partnership with AMDA – College and Conservatory of the Performing Arts. Today, AMDA is a thriving college with two locations, one in New York City and the other in Los Angeles, having grown well beyond its humble beginnings to become a fully accredited institution offering both conservatory studies and Bachelor of Fine Arts degrees to more than 1,000 students annually. AMDA’s Bachelor of Fine Arts Degree in Dance Theatre is a rigorous course of physical study grounded in classical technique and complemented by focused courses in a variety of dance styles. In this program, students become capable, multi-disciplined performers. AMDA’s immersive curriculum also gives you the solid entrepreneurial foundation necessary to thrive in the performing arts. From your very first day, our extraordinary faculty guides you through the foundation of the profession and encourages you to conceptualize. AMDA will offer two (2) $10,000 yearly scholarships for their Bachelor of Fine Arts Degree in Dance Theatre at each World Dance Movement 2014 event. The scholarships will be awarded by AMDA through the observation of students during class and in-person audition at World Dance Movement Spain, Switzerland, Italy and The Netherlands. The audition will consist in a brief admission interview and the performance of a 90- second solo chosen by the student. Any students interested in participating in the audition will need to email us at wdm@tezoroproductions.com after registering for a World Dance Movement event of their choice. This is an amazing opportunity for dancers who would like to study dance in college to learn how navigate the professional dance industry and gain the solid entrepreneurial foundation necessary to thrive in the performing arts. Feel free to contact us at wdm@tezoroproductions.com for any questions you may have! Please visit AMDA website for more information on the college and their dance program. Siamo felicissimi di annunciare una bellissima collaborazione con l’università americana AMDA – College and Conservatory of the Performing Arts. Oggi, AMDA è un college in rapida espansione con due location, una a New York City e l’altra a Los Angeles. Un’istituzione importante che offre sia studi di conservatorio che corsi universitari nell’ambito artistico per oltre 1.000 studenti ogni anno. AMDA’s Bachelor of Fine Arts Degree in Dance Theatre è un corso universitario quadriennale con radici nella tecnica classica completata da altri stili di danza. In questo programma, gli studenti acquisiscono la capacità di diventare persone di spettacolo complete. Il curriculum dell’AMDA offre anche la possibilità di ottenere le basi imprenditoriali ncessarie per avere successo nel mondo dell spettacolo. Sin dal primo giorno, gli insegnanti guideranno gli studenti attraverso le fondamenta della professione incoraggiandoli a concettualizzare. Ad ogni evento del World Dance Movement 2014, AMDA offrirà due (2) borse di studio del valore di $10.000 per ogni anno del loro corso universitario di danza (Bachelor of Fine Arts Degree in Dance Theatre). Le borse di studio saranno assegnate da AMDA attraverso l’osservazione degli studenti durante le lezioni e in una audizione al World Dance Movement Spagna, Svizzera, Italia e Paesi Bassi. L’audizione consisterà in un breve colloquio e l’esecuzione di un assolo scelto dallo studente. Gli studenti interessati all’audizione dovranno inviarci un’email a wdm@tezoroproductions.com per effettuare la prenotazione dopo essersi iscritti all’evento del World Dance Movement al quale vogliono partecipare. Questa è un’opportunità unica per i ballerini che vogliono studiare danza a livello universitario ed imparare a moversi nel mondo professionale della danza acquisendo le basi imprenditoriali necessarie per avere successo. Inviateci un’email a wdm@tezoroproductions.com per qualsiasi domanda! Potete visitare il sito di AMDA per maggiori informazioni sull’universita e il loro programma di danza. 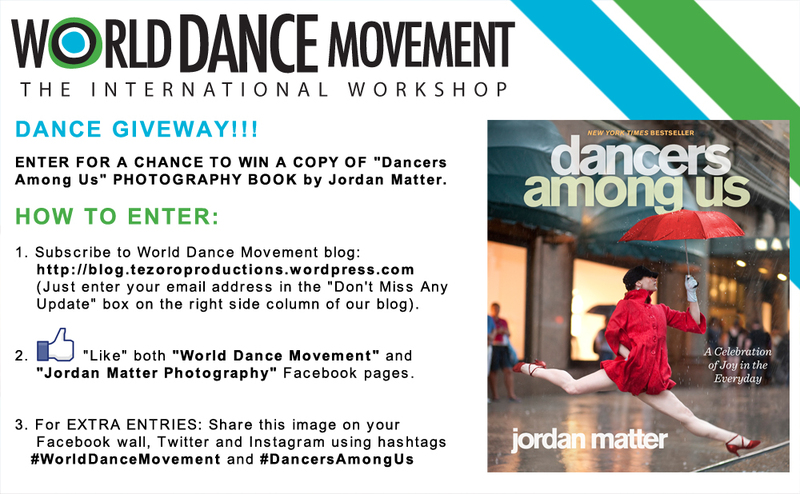 Dancers Among Us – An Amazing Dance Photography Book by Jordan Matter + Dance Giveaway! Read until the end to find out how to WIN a COPY OF THIS BEAUTIFUL DANCE PHOTOGRAPHY BOOK! Today we would like to present a photography book that caught our attention for the beauty of its images as well as its meaning. “Dancers among us” was published in 2012 by Jordan Matter and in it was included in the list of New York Times Bestseller, Oprah Magazine Best Books of 2012 and Barnes & Noble Best Books of 2012. Click on the image below to watch a fun backstage video! Jordan Matter is a New York photographer who has dedicated the last three years of his career to dancers and athletes photoshootings; his last works are “Dancers among us” and “Athletes among us“. These books are taking him to exhibits and shows all around he world where photography is perfectly matched with videos and performances. His last exhibit took place in Korea where the participants could be present at a quick photoshoot with Korean National Ballet‘s superstar Joo Won Kim and her partner Jeong-yun Lee of the National Dance Company of Korea. This book is a collection of pictures that present dancers dancing in unexpected places: a beach, a construction site, a library, a restaurant, a park… A celebration of the art of dancing and of the emotions of everyday life. A characteristic of these pictures is that the photographer didn’t use Photoshop or “tricks” such as trampolines or gimmicks. All the images are simply the expression of the photographer’s point of view trying to capture the beauty and the feelings that human bodies are able to express. 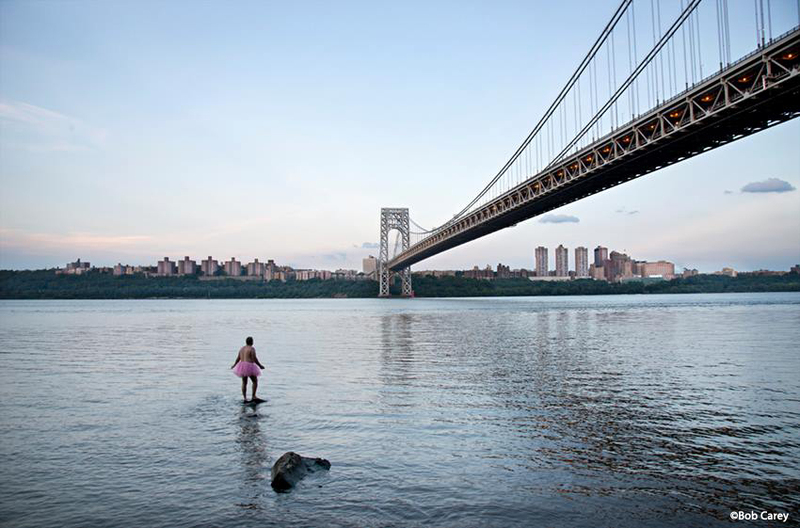 The images can be seen right now at a large-scale public exhibition in NYC until October 4th. Click here for more details. For further information about Jordan Matter visit his website and Facebook page. To purchase Dancers Among Us please click here. ENTER OUR GIVEAWAY FOR A CHANCE TO WIN A COPY OF “DANCERS AMONG US”! You have time until Oct. 15, 2013. 1. Subscribe to this blog (just enter your email address in the “Don’t Miss Any Update” box on the right side column of our blog). 3. For EXTRA ENTRIES: Share the image below on your Facebook wall, Twitter and Instagram using hashtags #WorldDanceMovement #DancersAmongUs (please make sure to use the hashtags, that’s the only way we can track your extra entries). Leggi fino alla fine per scoprire come VINCERE una COPIA DI QUESTO BELLLISSIMO LIBRO FOTOGRAFICO DI DANZA! Vogliamo parlare oggi di un libro che ha catturato la nostra attenzione per la bellezza delle immagini e il significato che porta. “Dancers among us” è il libro fotografico pubblicato nel 2012 da Jordan Matter, giudicato miglior libro del 2012 dalla rivista di Oprah ed entrato a far parte dei bestsellers del New York Times nello stesso anno. Jordan è un fotografo professionista newyorkese che negli ultimi tre anni si è dedicato a servizi fotografici per ballerini e atleti in generale; da qui le sue ultime opere: “Dancers among us” e “Athletes among us” che lo stanno portando in giro per il mondo tra mostre e spettacoli che uniscono la fotografia a video e show dal vivo. La sua ultima mostra è avvenuta in Korea dove i partecipanti hanno potuto assistere anche ad un servizio fotografico della stella del Korean National Ballet, Joo Won Kim e al suo partner, Jeong-yun Lee della National Dance Company of Korea. Il libro è una raccolta di fotografie che presentano ballerini mentre danzano in posti inaspettati: su una spiaggia, in un sito di costruzioni, in una libreria, in un ristorante, in un parco…. Una celebrazione all’arte della danza e alle emozioni che la vita quotidiana può regalare. La bellezza di questi scatti è data anche dal fatto che nessuna di esse è stata ritoccata con Photoshop e non sono stati utilizzati effetti speciali di alcun tipo: queste immagini sono solamente l’espressione del punto di vista di un fotografo che cattura la bellezza e le emozioni che il corpo umano può esprimere. Se volete saperne di più sul lavoro di questo brillante fotografo, visitate il suo sito e pagina Facebook. Per acquistare il visto clicca qui. 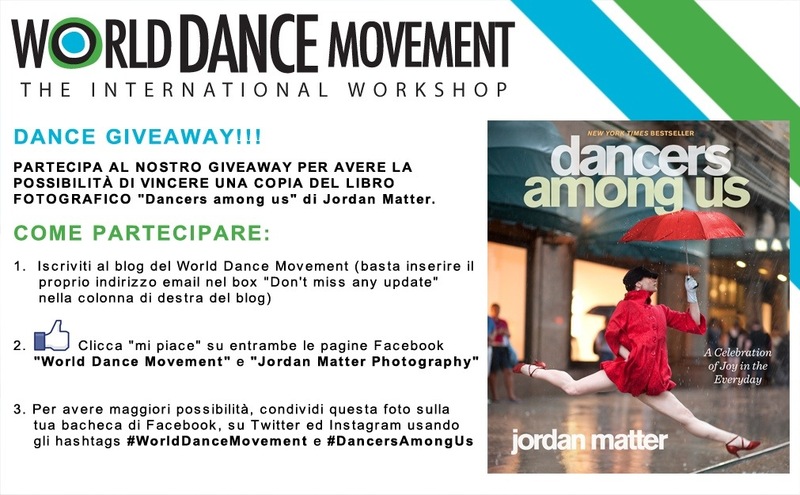 PARTECIPA AL NOSTRO GIVEAWAY PER VINCERE UNA COPIA DI “DANCERS AMONG US“! Avete tempo fino al 15 Ottobre, 2013! Chances are, everyone knows someone who has been affected by cancer. We all know what the pink ribbon stands for, what the yellow Livestrong bracelet represents, and that we can keep donating to various causes for a cure. A new cancer initiative, something most people are still unaware of, is the pink tutu. 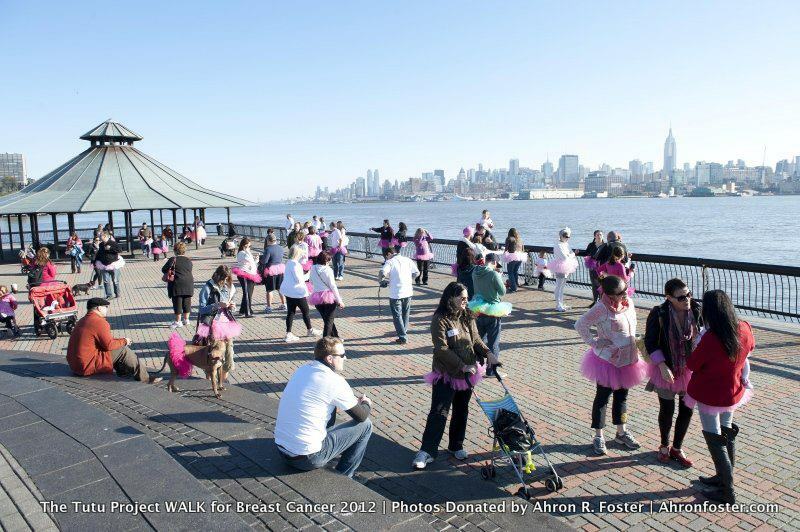 The pink tutu is an icon for Bob Carey’s The Tutu Project™. It all began as a silly game, but soon after Bob’s wife was diagnosed with a very aggressive form of breast cancer, he realized he could truly go somewhere with his idea. The Tutu Project™ is a collection of images of Bob photographed in a pink tutu, soon to be bound into a book, titled “Ballerina”. It shares entertaining stories about his adventures in a pink tulle. Initially the pictures gave Bob and his wife Linda something to laugh about during their difficult time. Now they have become much more!!! 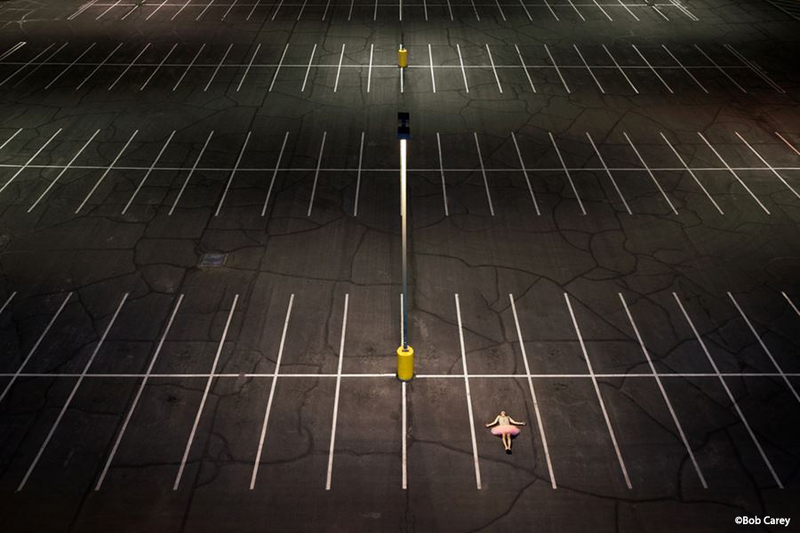 “Ballerina” has received nothing but praise from people who see the collection of photos. Because of this, Bob wants to share the book with other people in order to raise money to help women affected by breast cancer. He will self-publish “Ballerina” in the fall, and the net proceeds will go directly to breast cancer organizations, including CANCERcare and the Beth Israel Department of Integrative Medicine Fund. His goal is to make a difference in the lives of women with breast cancer and their loved ones. Bob’s goal is to raise $75,000. Please visit www.thetutuproject.com and help support the project. Any amount helps, and know you are truly making a difference in peoples lives. For more picture and updates please visit The Tutu Project Facebook page. È molto probabile che oggigiorno, purtroppo, ognuno di noi conosca una persona che è stata affetta dal cancro. Tutti quanti conosciamo il significato del nastro rosa o del braccialetto giallo “Livestrong”, e che è possibile donare a diverse associazioni che si occupano di ricerca per la cura del cancro. Una nuova iniziativa, di cui pochi sono ancora venuti a conoscenza, è quella del tutù rosa. Il tutù rosa è l’icona del progetto The Tutu Project™ di Bon Carey. Tutto iniziò come un gioco, ma dopo che alla moglie di Bob fu diagnosticata una forma di cancro al seno molto aggressiva, Bon si rese conto che poteva davvero realizzare qualcosa d’importante con il suo progetto. The Tutu Project™ è una raccolta di fotografie di Bob con un tutù rosa, che presto saranno raccolte in un libro intitolato “Ballerina”. Nel libro sono presentate foto divertenti delle avventure di un uomo che veste con un tulle rosa. Sono le foto che riuscivano a far ridere Bob e la moglie durante il periodo difficile del cancro ma ora sono diventate molto di più!!! “Ballerina” ha ricevuto complimenti da tutti coloro che hanno visto la collezione di fotografie, per questo Bob ha pensato di condividere il suo libro con la comunità per raccogliere fondi per aiutare altre donne affette dal cancro al seno. Il libro uscirà in autunno e sarà pubblicato in maniera autonoma. I proventi andranno direttamente ad associazioni che si occupano di ricerca sul cancro al seno, tra cui cancercare.org e Beth Israel Department of Integrative Medicine Fund. Il suo obiettivo è quello di fare la differenza nella vita di donne affette dal cancro al seno e delle loro famiglie. L’obiettivo di Bob è quello di raggiungere $75.000. Per contribuire alla sua causa, visita il sito del Tutu Project e contribuisci a supportare il progetto. Tutte le donazioni sono importanti, non importa la cifra! Per vedere altre foto e ricevere degli aggiornamenti su questa iniziativa potete visitare la Pagina Facebook del Tutu Project.